This seems as though it was an interesting idea back in 1934--but no doubt there were others thinking that instead of dropping mail on a city by a rocket that another payload could be substituted...better yet, just use the entire rocket for this delivery-of-something-else item and dispense with the parachute altogether. In any event, the idea never caught on (though megastars of rocket flight Hermann Oberth and Eugene Sanger discussed its possibilities in a positive light), and it seems as though there was only one instance of USPS rocket mail delivery--a converted nuclear-warheadless SSM-N-8 cruise missile was used to do so in 1959, and that seems about it. There is little doubt that scribes and woodblock cutters and such absorbed the stab of the movable type printing press, and that stationers felt the stab of modernity when the telegraph came into play threatening sales of paper generally used for letter-writing, an art form that they felt would be diminished by the new technology. At about the same time though came the second revolution in mail delivery, which made it cheaper and more regulated in using a more-competent mailing system, which meant an increase in letter writing. Ditto that for the telephone, which again would threaten written communication. Movies too threatened the theater, and on and on. That what comes to mind in viewing these ads unearthed by Matt Novak at Smithsonian.com for the American Federation of Musicians who were protesting the arrived-future in theaters of "robotic" or "canned' music--that is, recorded music that would replace the in-house small orchestras/organists that would play during live shows or movies. The ad extols the reader to join "in rebuking the proposal that mechanical music is adequate fare for the American intellect" by joining the Music defense League. At this point the musicians do have a case--even though the recorded music is just music recorded, which would be as good as the musicians who made the music, there was a larger issue of playback for the performance, which is where the "canned" part of "canned music" partially comes from. The quality of the speakers and so the so of the recording was not very high at this point, around 1930, so the clarity and richness and color of the music must all have suffered compared to its live performance. This also speaks to the "emotional" part of robots, as well as their influence on emotional/social aspects of the human experience--in this case, interpreting music (though there is no mention yet of creating or writing the music. But the robots-doing-our-creating-for-us part may be inherent in these ads, and this part of the history of Our Future Robot Overlords goes back a long but skinny and limited way, at least as far as the seemingly never-disappointing Daniel Defoe--that part of this story will have to wait for another day and a different two cups of coffee. I bumped into this robot in the pages of Illustrated London News for August 27, 1932. The idea of mechanical people had been around at least since the early 19th century, and by the time this one appeared i its gleaming glory in 1932, the word "robot" was around for a dozen years, invented in 1920 by Karel Capek for his book on the future called R.U.R. Actually the human-like forms created by Capek in this early scifi work were biotech, and not fully mechanized.) The form of the robot stretches back hundreds of years, in a way--if not the exactly the idea of a robot, but at least with the appearance of one. "Alpha" was anthropomorphic, but hardly what you'd call bio-mechanical, or even pretending to be so. It was created by Harry May of London, and was evidently 6'4" tall and weighed a ton (or two, perhaps), and was supposed to entertain and answer questions from the crowd when unveiled at the London Radio Exhibition of 1932. Mr. May kept the details of his creation secret, though no doubt the robot was operated offstage by confederates, the voice supplied by wireless. Still, Alpha was a major attraction, and kept people entertained, if not confused. In any event, it looked frightening as a vision of a possible 1930's future-vision. 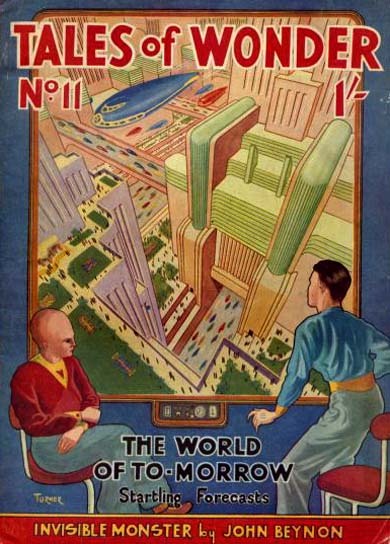 This creative vision of the future appears in Popular Mechanics (May 1932) and while picturing zeppelin-like space ships with stubby retractable wings traveling at 15,000 mph, it also depicts pilots in a very informal attitude of dress...they're also in a relatively cavernous command center with big gleaming instruments, including a very large compass and a very impressive graphical printout of some sort. Anyway it looks like a lot of big and heavy stuff in a big and bulky command center, which means the ship would've been bigger and bulkier, and who knows what was going to get it to the desired altitude of 600 miles for it to make its 15-minute Paris-Chicago flight. I think the sleeveless underwear deserved an explanation, but it found none. Rebecca Onion at Slate Vault surfaced this very interesting image of electric breath on her twitter account (@Slate Vault), showing early robotic creatures alive and well and living in the minds of thousands of young kids, placed their partially by stories like this found in the pulpy pages of Frank Tousey's Pluck and Luck in 1892. The image (from the special collections library at the University of South Florida (here)) shows yet another work of genius/ingenuity by the endlessly adventurous "Jack Wright" a boy inventor, who seemingly went everywhere, did everything, and had the stuff to make it all happen. I've posted1 many times on this blog about 19th century imaginary robotics, and had not seen this Wright story and his fabulous "electric deers". 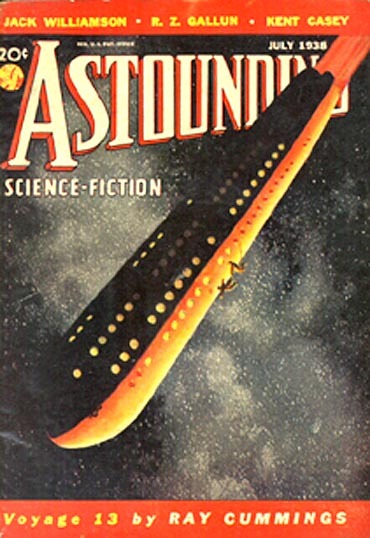 This Jack Wright adventure was written by "Noname", who turns out to be by Luis Senarens (1863-1939)2, a very prolific and early sci-fi writer, a Brooklyn boy, who had been referred to as an American version of Jules Verne. Senarens wrote beginning in the 1880's and was no doubt much taken by the new applications of electricity, and Senarens applied it quite liberally. In a quick browse, he introduced electricity inventively, sprinkling it liberally over powered machinery and introducing his own electric ocean liners, submarines, sledge boats, canoes, air-schooners, locomotives, balloon ships, torpedo rams, horses, and no doubt much else. I'm glad to have caught up to Mr. Senarens' robots. Just search "robot" in the google search box at upper right. Theodor Hosemann was a cartoonist, book illustrator, caricaturist and social commentator--but more interestingly, for today, he was edgy visioneer. The lithograph, "Extrabeilage zu Nr. 24 des Gewerbeblatt vom 24. Januar 1947", is Hosemann's somewhat noir-y vision of the future from his perch in 1847. His sense of the future "wirklickeit'/reality from where I sit here in 2015 is mostly bumpy and uncomfortable--it may have been funny in a fatalistic manner when the "brave" artist constructed the piece, perhaps like a forbidding fairy tale; if so then Hosemann was a jagged comic. It seems there are to me an equal number of found/lost elements in the image. The most obvious prognostications are the two steam vehicles/dampfwagen in the lower right, passing each other at the entrance of the engineering marvel that would have been a tunnel through the Alps. The anthropomorphic horseless carriage in the shape of a horse, steaming to the entrance, is driven by a guy who is (I guess) smoking a cigarette (as are several other people). Odd thing here is that the ciggie had just been introduced into France and named just a few years earlier, and here it is in the lips of a pater familias cruising with his family--his child flying a kite from the back seat--as they make their way to a trans-European ride. The steam vehicle exiting the tunnel is driven by a hooded figure whose three passengers are in various stages of welcoming teh new sights: one has a heavy headdress and is adorned by large steampunk goggles, while the woman seated behind him is having a private moment of some sort of exasperation; meanwhile the guy traveling on the roof of the car has just been hooked through the nose by a woman at teh tunnel top, seemingly fishing for, well, something. The most visible object is mysterious--the long skeleton at top is composed of bone, sausage, forks, spoons, morphing ducks, spoon vertebrae, plates, knives, corks, a champagne flute and a bottle. I'm unsure of the allegory. In the upper left corner we see women taking the waters, immersed in a hydrotherapy of something-or-other from a "healing source". A man beneath him lifts his hat to reveal a wild head of hair produced presumably from the bottle of "balsam" in his hand--hair tonic that has produced a giant mane plus hair sprouting out everywhere else. The man seated before him is beginning his meal on some sort of bird by pulling its eyeball out. The central figures are particularly engaging, and perhaps prophetic. At the top of this little structure is a Punch/Judy-like character with marionettes (standing beneath a sign that extols us not to laugh at bad jokes). He is also lazily seated on jars of babies. It may be that they are children being produced in artificial wombs, grown somehow, as beneath them we find more fully-formed children in cages being lectured by a classic schoolmaster with book-and-whip. Perhaps related to all of this in the foreground we find the "wonder child" who at seven years of age is very muscled and defeating grown men in a wrestling match,m one of whom he has thrown into the air with one arm. Perhaps Hosemann was telling us of the possible future from 68 years ago where a race of super-people would be manufactured in artificial environments to embody super-human traits? Certainly seems so. So Hosemann did get a few things right in this vision, or at least he got the sense of future developments correct. I still have a bit of a problem with what I think is the humor of it all, but then again I wouldn't read the fairy tells of the Brothers Grimm to a little kid, either. It is difficult to translate those sensibilities forward 175 years, for me, anyway, the sense of 'funny" and the insight that comes from that getting lost in the swirl of historic dust, like mostly all of the "amusing" parts of books (not the movie!) like Pinocchio, where the soft places to land in this child's story have all fallen away leaving not much more than a fledgling adventure in rounded brutalism. The world of possibility is limitless when there are no limits and almost no impossibilities. The history of seeing possibilities in the future, the history of looking into the future, is vast (with exponential growth in publication for each of the last three generations), and organizing it for a limited discussion difficult—there is a general temptation to simply classify all of it according to an alphabet of “ramas” of all possible Futuramas. How do we sort thousands of people writing about hundreds of thousands of future sightings in human development? Flying cars and people and cities and retrievable/liveable subconscious bits and dream, atomic blast guns, two-way wrist tv/radios, perfect places of nothing but intellect and floating intelligence, horseless cities, Soylent Green, personal computers small enough to fit into the trunk of your car, Edison's anti-grav underwear, buffalo herding from nuclear-powered sports cars, Maginot Line-sized mobile tank-ships, rockets to the Moon, rockets to the Sun, and rockets to tomorrow and to yesterday. We have futures where Manhattan is completely covered by thirty-story skyscrapers by the social warrior Thomas Nast; where George Holmes kills off cities with airplane-filled suburbs in 1912; where electric titan tank monsters with canons instead of cigarettes crushed hopeless opponents in 1918; where atomic-powered dirigible airports free up land in 1946; where a floating NYC is moored above the hole-in-the-ground where it once stood. 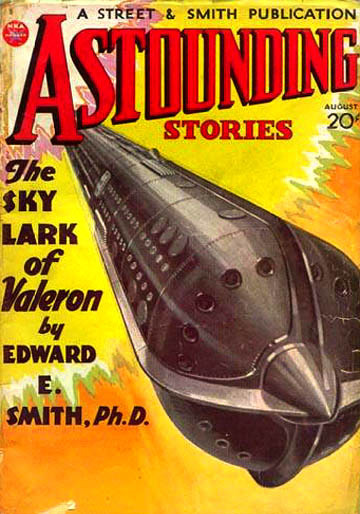 Where spacecraft of mega-sharp ultra-fins await their cigarette-smoking pilots in 1953 and out-Eiffeled mile-high vertical airport towers, and where an identical duplicate Earth floats serenely in place above a bird's-eye view of Manhattan. Much of the early technical thinking on the future seems neither utopian (in the traditions of Thomas More, Francis Bacon, Plato, Robert Owen, and such) nor what we would consider today to be dystopian (as with visions of Capek, Bradbury, Orwell, Burgess)--it seems to tend more towards a neutropia. And this does not include the earlier attempts at predicting the near future by looking at frothy bits of entrails or the shades of urine, or the oracles of thrown dice bones or draw of playing cards, or following the implications of human mole maps or seeking guidance in the alignment of stars in the sky. And at the top and bottom of it all are the religious futures of endless pain and comfort and nothingness and repetitive existences—but that doesn't feed into this topic, though the way time ticks through the reckoning of Brahma is very nicely suited to calculating versions of pieces of infinity. This effort of looking at the history of the future is easier when there are bookends, and there's no more a convenient end to the future as when it has a date. And in the past that date has often been the year 2000. Let's look at two very unusual examples of future thought experiments—one of which visualizes life in the year 2000—and both of which entertain what may be one of the ultimate considerations for the evolution of humans. One aspect of thinking about the future is the opposite of trying to include a sense of the future in the present—instead, it can be about removal. Removal of the present, distancing it from the present and the past. Removal of practices, though not necessarily principles. And perhaps one of the greatest of these removals is that of the human aspect of humanity: people replaced by created entities. In a way, a sort of 19th century singularity. A curious example of this can be found in the third edition of Jonathan Swift's tales of Lemuel Gulliver, where we see a Jorge Borgesian library-producing machine, a 20' square instrument made of cranks and cubes and turned by scribes producing an endless stream of knowledge. A wooden miracle replacing the human mind, an intelligent primum mobile with splinters. A great example of this high removal is found in "The century of invention Anno Domini 2000 or the march of aerostation, steam, rail roads, movable houses & perpetual motion,” a terrific lithograph, made ca. 1834, the handiwork and imagination of Charles Jameson Grant, a satirist and observer of high order. He tried looking into the future 165 years hence, and in some practicable ways he got a lot of it right--the imagery wasn't there, but the iconic sense of what may come to be was. We see small and large individual steam-powered four-wheeled vehicles, as well as plenty of balloons (in the spirit of aviation, at this point in its fourth decade and entering a great heyday) passing each other in every which way, off on adventures, or work, or in a race (as with the "out of Sight Club"). There are also numerous people flapping around in the sky ("winging it so early") with their (something)-powered wings, some of whom are ironically hunting birds. The main sensation here is speed, though I would not say it was democratic--the means to go to Dublin in your balloon "for an appetite" and return later in the day would have been fantastic to the 1834 reader trying to imagine doing such a thing on such a whim, with a newspaper in your lap, but certainly it would be available to the leisurely class. There was also an idea for balloonic communication, as one man in a balloon shouts to another to "give me a call by the first balloon," meaning perhaps a communication device, or a balloon-delivered letter. The dialog certainly portrays an attitude of unremarkable observation, conveying how commonplace flight and mobile towns and steam cars would be in the year 2000. That's where one of Grant's the great insights comes into play--at lower left there is a person excitedly remarking about a race, and particularly on the great rarity of the exhibition of a live horse. That Grant would make this an issue is interesting, as it would certainly rub the 1830s consciousness the opposite way of what the brain expected to see in the street, and that was horses. Horses powered almost all transportation at this time—save for the invention of the railroad, some of which were horse-powered—and to imagine a world in which the horse would be gone would've been, well, unimaginable. Also, too, the great and extensive coal mines fueling the Industrial Revolution going dry, the coal consumed. At the bottom of the print is the prize, a very unusual placard concerning robotics: "a cast iron Parson will preach by steam at Fudge Church.” This is doubly intriguing because it not only invokes a steam-powered person—still fairly rare in the literature in the first third of the 19th century—but also a thinking one, a parson, a mechanical object trusted with the preaching and interpretation of a basic human belief system. This seems a bit on the primitive side in its display, but the intellectual imagery is pretty powerful stuff. I assume that the power of this would've been less so at the time of publication, guessing that Grant was making more of a not-so-subtle satire on the steam-driven puffery of some preachers with the creativity of kettles, and that in the future this would be magnified to the point of steam and smoke. But still the idea of placing the deeply emotional stuff of belief systems in the control of a machine is extraordinary for the time. A few years earlier William Heath's March of the Intellect series (1825-1829) displayed another robotic entity witha book-driven intellect in its “crown of many towers” (London University) that swept up the great "rubbish" and "dust" of society. The robot was thinking in its way, distilling the promise of data and intelligence in its book-laden head, firing its set of gas-light eyes, iron arms, and legs made of printer's tools, sweeping away useless and insulting lawyers and jurists and their legal wigs and obsolete and repetitive rules, medical quacks, and the dust of other official abuses, "sweeping rubbish from the land.” It was making decisions and acting on them, trumping the humans in its path. It is a remarkable leap, the consequences of which are difficult to put into perspective. I can think of an example from the novel Flatland, by Edwin Abbott, when its two dimensional characters first encounter a three dimensional figure—superbly incomprehensible at first, understanding following with some difficulty. Visualizing the assumption of a created intelligence developed enough to supplant or supervise human thought and activity was probably beyond the 19th century sensibility—just as its technical aspects are to us now. The etching in question, illustrating "Air-um Scare-um Travelling" appeared in the Comic Almanack (1843), and outlines a clear and hopeful image of future travel. The ads show that there are frequent flights to far-away places, including Mont Blanc and Beijing. 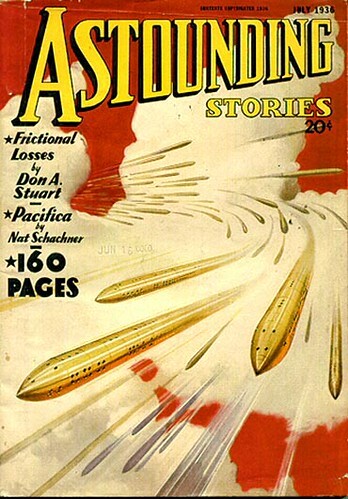 It is interesting that the future is tempered somewhat by including an exploding airship at bottom left--so the future may be wondrous and exciting, though not without its dangers. I've addressed the ideas of early mechanical men elsewhere in this blog (just enter "robot" in the site search box at left and you'll find two or three dozen related posts on the subject), but failed to include this very fine and early example by William Heath in his March of Intellect series (printed from 1825-1829). He was particularly bitter about what he saw as an aristocracy of official ruination, and created an unusual steam-driven mechanical man with a book-driven intellect that swept up the great "rubbish" and "dust" of society. At the top of this early robot (preceding the invention of the term by about 100 years) was a pile of books with a "crown of many towers", which was London University, beneath which was a set of gas-light eyes, iron arms, and legs made of printer's tools, sweeping away useless and insulting lawyers and jurists and their legal wigs and obsolete and repetitive rules, medical quacks, and the dust of other official abuses, "sweeping rubbish from the land". Another near-robotic image by Heath is his pre-Rube Goldberg automatic house, a central feature in the March of the Intellect No.2 (1829) which features fantastic flying machines hovering and screaming past the house. It isn't a robot unless you consider the entire house as a host for all of the things going on inside itself, and then you have something else entirely.